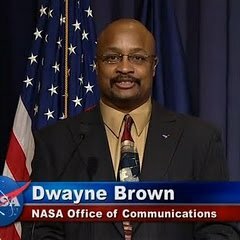 Dwayne Brown has more than 35 years of experience in NASA public affairs operations at the agency’s headquarters in Washington, D. C. From 1998 - 2000, he was the first African American senior public affairs officer for NASA’s Office of Space Flight. Currently, he leads and coordinates multimedia products for science-related discoveries and activities for the news media and the general public. Brown has supported many missions during his tenure, including Voyagers 1&2 , the Hubble Space Telescope, Mars Curiosity Rover, the New Horizons spacecraft flyby of Pluto, Juno mission to Jupiter, and the launch of the first U.S. mission to an asteroid that will return samples back to Earth for study. He has led or assisted in coordinating communications activities for over 150 space missions, moderated over 200 television and phone media briefings, and trained and advised newly hired NASA public affairs officers. Notably, he coordinated post-mission media and outreach tours for Dr. Mae Jemison, the first African American female astronaut to fly in space. He is the recipient of numerous NASA awards, including the prestigious Silver Snoopy award which is given only by astronauts, the Superior Service medal, and the Exceptional Service medal.